Objective: The aim of the present study was to evaluate the etiological factors and patterns of oral and maxillofacial fractures in patients treated at Jazan Province. Methods: A retrospective institute-based study of oral and maxillofacial trauma patients was carried out from November 2016 to April 2017. The records of 133 patients between the ages of 0–75 years were included. The data were categorized by demographic details, mode of injury, etiology, and anatomical fracture site. Chi-square test was applied for statistical analysis according to age group, nationality, and gender at P < 0.05. Results: Radiographs revealed that mandible fractures (50.7%) were more commonly found followed by zygomaticomaxillary complex fractures as 18.2%. Less number of cases showed nasoorbitoethmoidal and maxillary fractures as 5.3% and 4.6%, respectively. Further males were predominantly more affected with maxillofacial injuries than females, and the highest rate of injuries was in seen the age group of 20–29 years as 51 (38.6%). Records also mentioned that road traffic accidents (RTAs) were the most significant source behind the facial injuries (65.9%). Conclusion: Mandibular fractures were dominant over other types of maxillofacial fractures, and RTA was the key factor in the etiology of oral and maxillofacial facial injuries. Hence, road safety rules should be strictly implemented. Skeleton, dental, and soft-tissue components of the facial region are likely to get injured during any kind of trauma. Trauma related to orofacial region generally lead to deprived functional and esthetic outcomes and ultimately hampers the quality of life. The World Health Organization estimated that approximately 3000 people are killed, and another 30,000 are wounded or disabled every day due to road traffic accidents (RTAs). The etiological factors of maxillofacial fractures are constantly changing over time, especially in developed countries. The occurrence and pattern of oral and maxillofacial injuries vary from place to place depending on geographical, cultural, and environmental factors. The leading factors of this type of injuries are RTA, falls, interpersonal violence, sport's injuries, occupational accidents, and terrorism.,, The habit of consuming alcohol and other drugs also play a significant part in the etiology of these type of incidents. Understanding risk factors of maxillofacial trauma assist in the evaluation of behavioral patterns of different populations and also to set up effective preventive measures. Oral and maxillofacial region comprises of soft and hard that extends from the frontal bone to the lower border of the mandible inferiorly. The pattern of injuries mainly depends on the mechanism of injury, direction and strength of impact force, and anatomical site. Few published studies are available on the occurrence of maxillofacial trauma in Saudi Arabia., Through extensive search, we could not retrieve any published papers on maxillofacial trauma in Jazan Province. In view of that, the present retrospective study was done to describe the etiologies and patterns of oral and maxillofacial fractures at Jazan Province, Saudi Arabia. This is a retrospective study of records of patients managed for maxillofacial injuries between November 2016 and April 2017 from the three main general hospitals in Jazan province. Jazan is one of the 13 administrative regions of Saudi Arabia, located on the farthest southwest of Saudi Arabia. According to the 2010 Saudi Arabia national population census, the region is populated by approximately 1.5 million people. Only patients who reported with maxillofacial injuries and had appropriate hospital records were included in the study. In addition, they should have undergone detailed clinical examinations; diagnosis finalized on the basis of clinical condition and radiographic investigations (panoramic radiographs and/or computed tomography scans). All the traumas were grouped and coded according to the International Classification of Diseases. Injuries were then grouped as maxillary fractures, mandibular fractures, soft-tissue injuries, zygomatic fractures, orbital fractures, panfacial fractures, and nasoorbitoethmoidal fractures (NOE). Data analysis was done with Statistical Package for Social Sciences (version 16, IBM Corp., Armonk, NY, USA). Prevalence rates of different maxillofacial traumas were calculated. Chi-square test was applied according to determine the association between etilogy, type of fracture with age group, nationality, and gender. The level of statistical significance was set at P < 0.05. The records of 133 patients of ages from 2 months to 75 years were retrospectively analyzed. The prevalence of cases with isolated soft-tissue injuries was 9.0% mainly including lip lacerations and burns, both intra and extra orally as illustrated in [Figure 1]. Males had contributed to 112 (84.8%) cases of facial trauma with only 20 (15.2%) females (P = 0.379) as mentioned in [Table 1]. The highest rate of maxillofacial fractures was in seen the age group of 20–29 years 51 (38.6%), pursued by 10–19 years 30 (22.7%), the age group of more than 30 years 27 (20.5%), and 0–9 years 24 (18.2%) (P = 0.711) as shown in [Table 2]. RTAs were the most common etiological factor for facial trauma 80 (65.9%). The second most regular source of maxillofacial trauma was interpersonal violence among 18 (15.2%) of the patients. 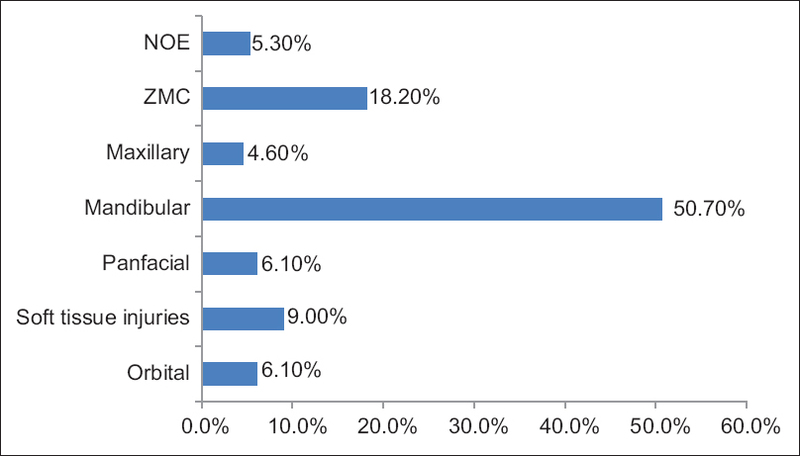 Some of them were affected by other reasons 5 (4.5%) as occupational hazards and war injuries. 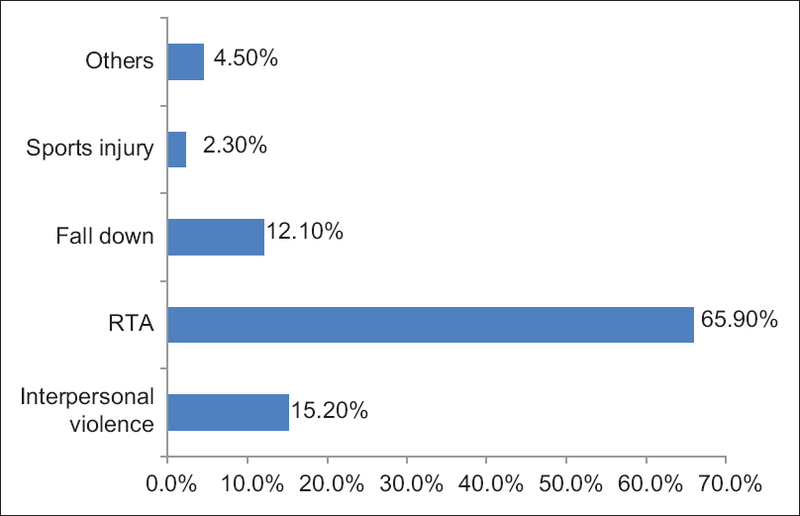 Sports contributed to only 3 (2.3%) maxillofacial trauma [Figure 2]. Ninety-one percent of cases in our study had fractures of the facial skeleton. In this study, more than 50% of fractures were in the mandible region followed by zygomaticomaxillary complex fractures as 18.2%. Both orbital and panfacial fractures had the frequency of 6.1%. A lesser amount of cases showed NOE and maxillary fractures as 5.3% and 4.6%, respectively. 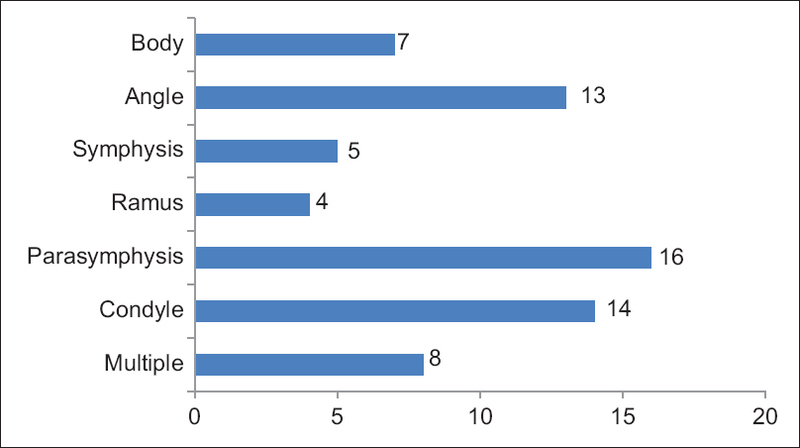 As the prevalence of mandible fractures was high, these fractures were further categorized according to different anatomical sites. Parasymphysis fractures had the highest rate (23.8%) and ramus on the lower position (6.15%) [Figure 3]. The incidence of bilateral mandibular fractures was 37.9% followed by left side fractures 34.1% and right side fractures 28.0%. 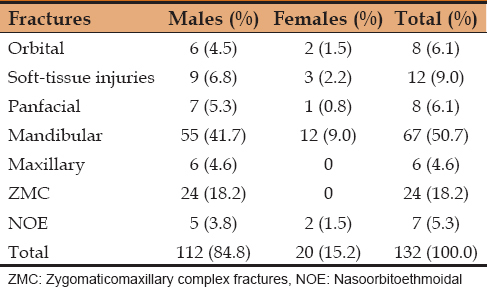 The present study also correlated maxillofacial fractures with gender and found that 84.8% of the cases belong to males and merely 15.2% to females. Almost similar results were obtained by Fama et al., showing 86% in males and 14% in females. In addition, Sohns et al. also found higher rate of facial trauma in male subjects (64%). It could be due to females lower tendency to violent behavior and their less involvement in outdoor activities, especially in Saudi Arabia. The present authors recorded higher prevalence Maxillofacial trauma in the age group of 20–29 years (51[38.6%]) and less in 0–9 years (24 [18.2%]). The more recurrent connection of this age group with accidents might be due to their association with additional travelling and other outdoor activities. Similarly, Fama et al. found maximum occurrence of facial injuries in the age group of 3rd to 4th decades of life. On the other hand, La-Salete et al. also stated that patients aged between 30 and 39 years were the most commonly affected by maxillofacial injuries. Our current finding showed that mandibular fractures were the most common type of maxillofacial fracture. These figures are comparable to the other similar studies which demonstrated nearly same prevalence of mandible fracture., Abdullah et al. in Riyadh City (56.4%) and Algamadi et al. in Mecca city (60,4%). Observed a little higher percentage of mandibular traumas in their studies. However, Gassner et al., 2003 in Austria mentioned middle-third of the face as the most common anatomical site of facial injury. This dissimilarity mainly due to the difference in etiological factors of fracture, which were RTA in our study and activities of daily life and falls (from heights). In another study by Agnihotri et al., nasal bone was most recurrently affected (23.7%), pursued by mandible (22.7%), and zygomatic complex (19.3%). We noticed that incidence of mandibular fracture were the highest in the parasymphysis followed by the condyle and angle of the mandible. Khadka and Chaurasia also reported parasymphysis as the main part affected by trauma. However, Rashid et al. found that body of the mandible, angle of the mandible, and subcondyle to be the most common anatomical sites of fracture in their study group. The study has some limitations as several cases were excluded because they were not recorded properly due to perhaps suspected interpersonal violence among their family members or their reluctance to truthfully volunteer information as regard the authentic cause of injury. The frequency of mandibular fractures was far above than the other type of maxillofacial fractures. Parasymphysis fractures were more frequently reported compared to other fractures of mandible. Furthermore, males were mostly affected with facial trauma. It is evident that RTA was the key factor in the etiology of oral and maxillofacial facial injuries and the young persons (20–29 years) were the principal sufferers. Therefore, road safety measures and traffic legislations such as regular use of seat belts and helmets should be enforced. Fama F, Cicciu M, Sindoni A, Nastro-Siniscalchi E, Falzea R, Cervino G, et al. Maxillofacial and concomitant serious injuries: An eight-year single center experience. Chin J Traumatol 2017;20:4-8. Malik S, Singh G, Kaur G, Yadav S, Mittal HC. Orofacial trauma in rural India: A clinical study. Chin J Traumatol 2017;20:216-21. Udeabor SE, Akinbami BO, Yarhere KS, Obiechina AE. Maxillofacial Fractures: Etiology, Pattern of Presentation, and Treatment in University of Port Harcourt Teaching Hospital, Port Harcourt, Nigeria. J Dent Surg 2014; doi:10.1155/2014/850814. Maliska MC, Lima Júnior SM, Gil JN. Analysis of 185 maxillofacial fractures in the state of Santa Catarina, Brazil. Braz Oral Res 2009;23:268-74. Alves LS, Aragão I, Sousa MJ, Gomes E. Pattern of maxillofacial fractures in severe multiple trauma patients: A 7-year prospective study. Braz Dent J 2014;25:561-4. Batstone MD, Monsour FN, Pattel P, Lynham A. The patterns of facial injury suffered by patients in road traffic accidents: A case controlled study. Int J Surg 2007;5:250-4. Bali R, Sharma P, Garg A, Dhillon G. A comprehensive study on maxillofacial trauma conducted in Yamunanagar, India. J Inj Violence Res 2013;5:108-16. Qudah MA, Al-Khateeb T, Bataineh AB, Rawashdeh MA. Mandibular fractures in Jordanians: A comparative study between young and adult patients. J Craniomaxillofac Surg 2005;33:103-6. Al Ghamdi A. Road Traffic Accidents in Saudi Arabia Causes, Effects and Solutions 1418 H. Saudi Arabia: General Traffic Department; 1998. Sohns JM, Staab W, Sohns C, Schwarz A, Streit U, Hosseini AS, et al. Current perspective of multidetector computed tomography (MDCT) in patients after midface and craniofacial trauma. Clin Imaging 2013;37:728-33. Khadka R, Chaurasia NK. Four years prospective study of the maxillofacial trauma at a tertiary center in Western Nepal. J Orofac Sci 2014;6:78-81. Lee JH, Cho BK, Park WJ. A 4-year retrospective study of facial fractures on Jeju, Korea. J Craniomaxillofac Surg 2010;38:192-6. Lee K. Trend of alcohol involvement in maxillofacial trauma. Oral Surg Oral Med Oral Pathol Oral Radiol Endod 2009;107:e9-13. Al Ahmed HE, Jaber MA, Abu Fanas SH, Karas M. The pattern of maxillofacial fractures in Sharjah, United Arab Emirates: A review of 230 cases. Oral Surg Oral Med Oral Pathol Oral Radiol Endod 2004;98:166-70. Alghamsi S, Alhabab R, Alsalmi S. The epidemiology, incidence and patterns of maxillofacial fractures in Jeddah city, Saudi Arabia. Int J Oral Maxillofac Surg 2017;46:255. Rashid A, Eyeson J, Haider D, van Gijn D, Fan K. Incidence and patterns of mandibular fractures during a 5-year period in a London teaching hospital. Br J Oral Maxillofac Surg 2013;51:794-8.